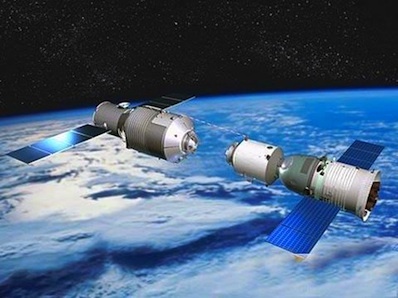 China's next human spaceflight will blast off between June and August and dock with the country's Tiangong 1 orbiting laboratory module, Chinese space officials announced Friday. The Shenzhou 9 mission will carry three astronauts on China's fourth piloted spaceflight, according to the China Manned Space Engineering Office. The announcement, also reported by the state-run Xinhua news agency, said the Shenzhou 9 crew will conduct a manual docking with the Tiangong 1 module. The astronauts will enter Tiangong 1's pressurized compartment to conduct space science experiments, the manned space office said. Officials did not disclose the planned duration of the mission or the identity of its crew. Xinhua last year reported two women were among nine finalists for the next spaceflight. Shenzhou 9 and Tiangong 1 will form a mini-space station 60 feet long with more than 700 cubic feet of habitable volume inside. A spokesman with the engineering office, called CMSEO, said an evaluation of the results from an uncrewed docking demonstration flight last year concluded all systems were ready for a human mission. The Shenzhou 9 spacecraft and its Long March 2F carrier rocket are undergoing final checks before the mission, according to CMSEO. The Tiangong modules are pathfinders for a future space station China hopes to construct in orbit by 2020. 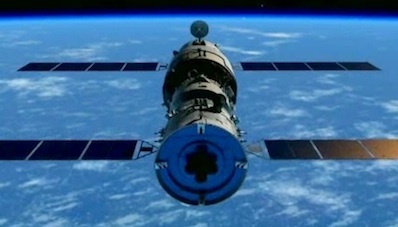 Tiangong 1 launched in September 2011. The previous Shenzhou mission launched Oct. 31 and docked with Tiangong 1 two days later, completing China's first automated link-up in orbit. After separating later in the mission, Shenzhou 8 approached the target module for a second docking to test the performance of its optical rendezvous sensors against severe sun glare. The Shenzhou docking collar is similar to the Russian-designed APAS system, which was used in the joint U.S.-Soviet Apollo-Soyuz Test Project, the assembly of the Russian space station Mir and by space shuttles visiting the International Space Station. The androgynous docking system is designed so either spacecraft can be active or passive. China says the docking system would permit Shenzhou capsules to attach to the ISS if the country was ever invited to join the multinational research laboratory.